Studies of affect recognition can inform our understanding of the interpersonal effects of alcohol and help develop a more complete neuropsychological profile of this drug. The objective of the study was to examine affect recognition in social drinkers using a novel dynamic affect-recognition task, sampling performance across a range of evolutionarily significant target emotions and neutral expressions. Participants received 0, 0.4 or 0.8 g/kg alcohol in a double-blind, independent groups design. Relatively naturalistic changes in facial expression—from neutral (mouth open) to increasing intensities of target emotions, as well as neutral (mouth closed)—were simulated using computer-generated dynamic morphs. Accuracy and reaction time were measured and a two-high-threshold model applied to hits and false-alarm data to determine sensitivity and response bias. 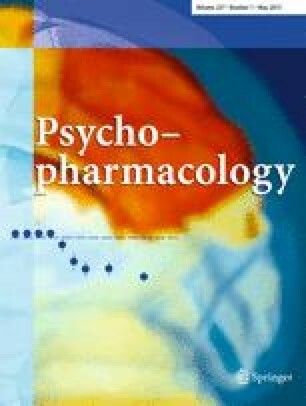 While there was no effect on the principal emotion expressions (happiness, sadness, fear, anger and disgust), compared to those receiving 0.8 g/kg of alcohol and placebo, participants administered with 0.4 g/kg alcohol tended to show an enhanced response bias to neutral expressions. Exploration of this effect suggested an accompanying tendency to misattribute neutrality to sad expressions following the 0.4-g/kg dose. The 0.4-g/kg alcohol—but not 0.8 g/kg—produced a limited and specific modification in affect recognition evidenced by a neutral response bias and possibly an accompanying tendency to misclassify sad expressions as neutral. In light of previous findings on involuntary negative memory following the 0.4-g/kg dose, we suggest that moderate—but not high—doses of alcohol have a special relevance to emotional processing in social drinkers. The authors gratefully acknowledge grant support from Alcohol Research UK awarded to SKK, JB and HVC.